The East African Community (EAC) is a regional intergovernmental organization of the Republics of Rwanda, Burundi, Kenya, Uganda and the united Republic of Tanzania which also hosts the EAC Headquarters in Arusha. The EAC Youth Summit held in Arusha, Tanzania from 2nd – 3rd November 2007 set the precedent for youth participation in the EAC integration. The Summit acknowledged that information sharing; education on EAC integration and development is fundamental for enhancement and sustainability of regional integration. 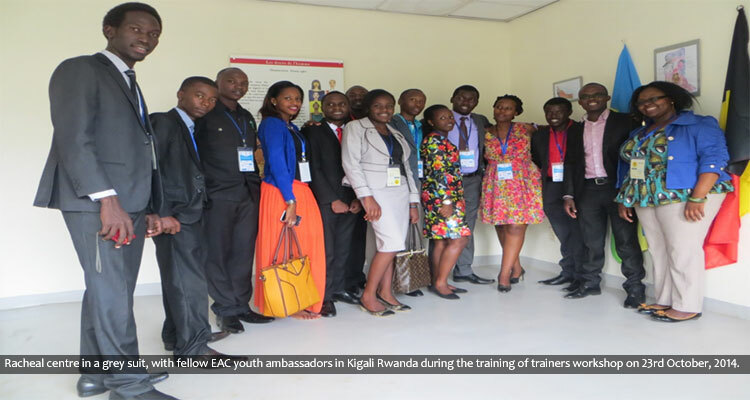 The youth called upon the EAC to engage young people as partners to reach out to their peers on issues of EAC Integration processes, as one of the tools to drive national and regional development. In 2012 the EAC Secretariat held the 1st EAC University Students Debate on Regional Integration. The aim of the debate was to provide a regional platform to promote dialogue among the youth and interest them in advocating for regional integration initiatives. The main objective of the University Student’s Debate is to promote continuous dialogue among the youth and to interest them in advocating for regional integration initiatives. The debate specifically sought to: Ensure continued participation of the youth in the integration matters in the EAC region; Encourage networking among university students in a bid to enhance EAC integration; Popularize the EAC integration agenda through creating platforms that encourage sharing of experiences; and Prepare the youth for future leadership roles as they hold the mantle as Ambassadors of Integration in the region. 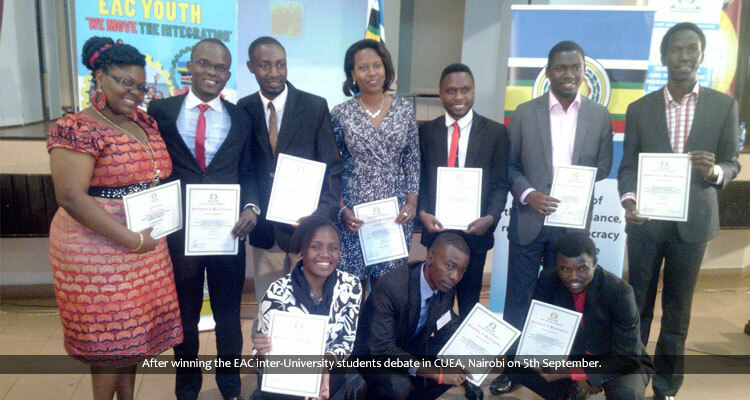 The 3rd EAC university students’ debate on regional integration took place from 4th – 5th September, 2014, in Nairobi- Kenya. The debate was held at The Catholic University of Eastern Africa and attracted over 150 participants from both public and private institutions of higher learning including lecturers, youth leaders from national youth councils and networks, EAC Club coordinators, civil society and representatives from Ministry of East African Community Affairs from Partner States. The theme for the Debate was “A Federated East African Community: A prerequisite for economic development and sustainable peace and security in the EAC Region”. The Debate was moderated by 5 judges drawn from academia, civil society, EAC Youth Ambassadors’ Platform, Ministry of East African Affairs, Commerce and Tourism and EAC Secretariat. During the Gala Dinner, 5 EAC youth ambassadors and 5 deputy ambassadors were appointed to champion regional integration.Racheal Omukhulu Makokha, from Technical University of Kenya, a 4th year student pursuing a BA in International Relations and Diplomacy was appointed the Deputy Youth Ambassador to Kenya. The appointed ambassadors and their deputies were commissioned during the Training of Trainers’ Workshop on EAC integration, processes, and structures on 20th- 22nd October, 2014 in Kigali, Rwanda and thereafter attended the 3rd Academia- Public and Private sector Partnership Forum on 23rd-24th October, 2014 in Kigali. The ambassadors participated in the forum as panelists in the high level- dialogue that was officially opened by the President of Republic of Rwanda, H.E Paul Kagame. The forum was organized by the Inter-University Council of East Africa and the East Africa Business Council. Be a role model in advocating for a people, and especially youth centered EAC integration process. My Mission is to sensitize EAC integration benefits to university students in Kenya and how they stand to gain from it.